Henri Martelli was bom on February 6, 1895 in Bastia, and died on August 15, 1980 in Paris. After schooling at the Lycée National in Bastia, and graduation in Aix-enProvence, he studied law at the University of Paris, where he obtained his degree. Entering the Paris Conservatory in 1912, he studied fugue and composition with Caussade and Charles-Marie Widor until 1924. An Institut de France prizewinner, chairman of the Société Nationale de Musique, he was director of orchestral and chamber music programmes on the radio from 1940 to 1944. He was chairman of the French section of the S.M.l. C. in 1953, and chairman of the Société Vivaldi. In the publication Le Temps, Florent Schmitt spoke of him as follows : "This son of Corsica is not a dreamer, despite bis legendary absent-mindedness, but a true man of action, suited above all to contrapuntal techniques, which he controls with quasiNapolionic mastery and perspicacity, as is required". His neo-classical style does not disdain polytonality. His works are many. They include symphonie music (3 symphonies, 1 sinfonietta, 7 concertos), chamber music (8 sonatas, 1 octet, 3 quintets, 3 quartets, 3 trios, sorne 30 suites), vocal music (choirs and melodies), stage, radio, 2 ballets, an opera, or "lyric poem" (The Song of Roland), and a comic opera based on Labiche (Le major Cravachon). 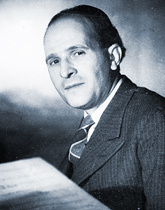 The Bas-Reliefs Assyriens (1928) and the Concerto for Orchestra ( 1931 ) were first performed by the Boston Symphony Orchestra conducted by Koussevitzki.